That’s right, I said it. I don’t like boxwood. I realize that may make me the only garden designer in North America who doesn’t care for members of the Buxus clan. Boxwood used as a hedge. Tidy, green, and pretty, right? Not so fast. 1. It has lovely, shiny green leaves. 2. It is evergreen, which is never something you should overlook in a location with miserable winters. 3. It handles shearing just fine, which makes it well suited to hedges and topiaries. 4. It’s a go-to plant for creating instant formality. Plunk down some boxwood around some pavers and you have instant English courtyard. 1. Boxwood is expensive. It takes a long time to grow from cutting into saleable size, so it is proportionally more expensive than many other shrubs. Boxwood with winter kill. Not so pretty now, huh? Photo from powellgardens.blogspot.com. 2. 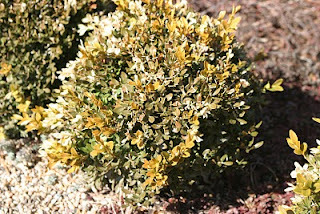 Boxwood is prone to winter kill in Indiana. I have cut more dead out of boxwood in customers’ gardens than I care to remember. And it’s hard to achieve that lovely, smooth green hedge look if you have to take out 1/3 of the shrub to get rid of the dead, brown branches. 3. Boxwood smells like cat pee. I have three cats. I know cat pee when I smell it. Right, so maybe I don’t hate it. I just don’t think it’s a good plant for Indiana. Boxwood has its place. That place is England, where it grows into luscious hedges and perfect topiaries because it doesn’t have to contend with bitterly cold winters. I’ll also give it most of the southeastern United States. I was once in an antebellum garden in South Carolina where the miasma of boxwood hung so heavily you could practically cut it. The box were beautiful and green, carefully shaped to give the garden definition. The green, the thick smell, the air of swampy Southern living–that’s the right place for boxwood. Boxwood has become so ubiquitous in garden design that it can be tricky to find substitutes for it. Holly is a lovely evergreen, although it doesn’t shear as well as box does. Yew tends to get pretty big. 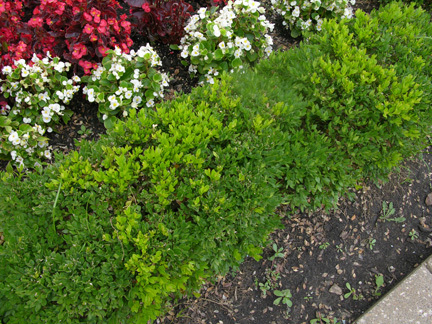 Some designers recommend euonymous–sheared on a monthly basis, I would guess–but if there’s a plant with even fewer right places than boxwood, it’s euonymous. 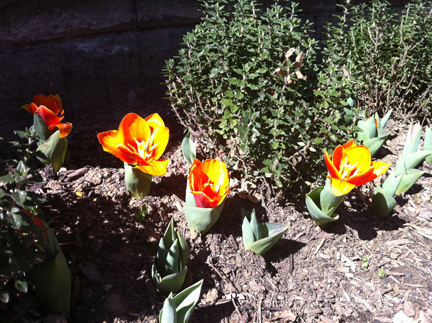 That's germander, right there next to the tulips. I have found a substitute for a very low hedge, though. I’d like to ring my front-yard circular vegetable bed with an evergreen hedge to give the garden more structure. Germander fits the bill nicely. Teucrium chamaedrys is evergreen, with shiny little leaves. It gets about a foot tall and takes well to shearing. This herb even flowers; purple to pink blooms appear in late spring. I’ll be planting it about a foot apart, allowing the individual plants to grow into each other.